Proponents of drug criminalization fear a rational and substantive discussion of drug policy because the evidence destroys their claims. Last Friday at the Cato Institute, I presented my study on the success of drug decriminalization in Portugal. I wrote about how and why I worked on this report here, and the report itself is available to read or download here. At Friday's event, I presented the report's findings in a 30-minute presentation; a long-time skeptic of drug decriminalization -- University of Maryland Criminology Professor Peter Reuter of the School of Public Policy -- commented on the report; I then responded to his commentary, and that was followed by a question-and-answer session. The video of the full event is now online here. Peter Reuter, a criminologist at the University of Maryland, College Park, says he's skeptical decriminalization was the sole reason drug use slid in Portugal, noting that another factor, especially among teens, was a global decline in marijuana use. By the same token, he notes that critics were wrong in their warnings that decriminalizing drugs would make Lisbon a drug mecca. "Drug decriminalization did reach its primary goal in Portugal," of reducing the health consequences of drug use, he says, "and did not lead to Lisbon becoming a drug tourist destination." Walter Kemp, a spokesperson for the United Nations Office on Drugs and Crime, says decriminalization in Portugal "appears to be working." He adds that his office is putting more emphasis on improving health outcomes, such as reducing needle-borne infections, but that it does not explicitly support decriminalization, "because it smacks of legalization.". . . .
A spokesperson for the White House's Office of National Drug Control Policy declined to comment, citing the pending Senate confirmation of the office's new director, former Seattle Police Chief Gil Kerlikowske. The U.S. Drug Enforcement Administration (DEA) and the U.S. Department of State's Bureau of International Narcotics and Law Enforcement Affairs also declined to comment on the report. There are also articles on the report from Raw Story's Rachel Oswald (here); CAP's Campus Progress' Jesse Singal (here); Marijuana Policy Project's Dan Bernath (here); and Stop the Drug War's Scott Morgan (here). Other large publications -- including Time -- assigned a reporter to cover this event and it's likely there will be additional articles. As the above-excerpted passage from Scientific American demonstrates, there are few debates driven by as much rank irrationality as those over drug policy. Thus, we have emphatic acknowledgments that decriminalization has been a resounding success -- it has enabled the Portuguese to manage what had been their out-of-control drug crises of the 1990s far better than virtually every other country that continues to criminalize drug usage -- combined with ongoing opposition to that successful policy (along with the U.S. Government's steadfast refusal even to comment on the success of decriminalization in Portugal). That is the very definition of irrationality. For every drug that was in use since 2001 -- every one -- absolute drug usage rates declined in the five years following decriminalization, and that occurred as drug usage rates in most other EU member-states was increasing, often severely. 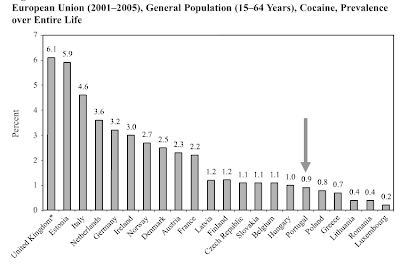 Prior to decriminalization -- throughout the 1990s -- Portugal had among the worst drug crises in the EU, if not the worst. The more they criminalized, the worse the problems became. 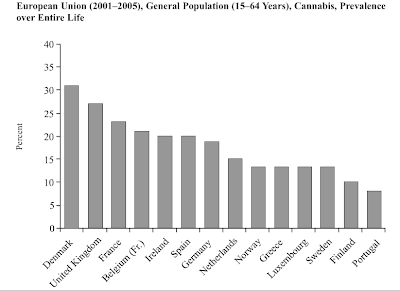 After decriminalization, Portugal has among the best drug usage rates both within the EU and outside of the EU (especially when compared to the harshest criminalized countries, such as the U.S. and Great Britain). Those are just facts. The central myth which shields our failed drug laws from challenge and scrutiny is that decriminalization or legalization will cause an explosion of increased drug use. That is patently false. 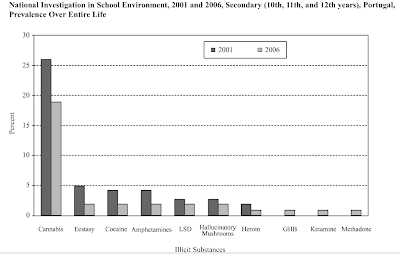 A much stronger argument can be made that the exact opposite is true: that by eliminating the barriers of fear which criminalization imposes between the government and the citizenry, and by freeing up the vast resources which criminalization squanders on arrests, prosecutions and imprisonment and instead devoting those resources to treatment, harm-reduction and education programs, few things are more effective in reducing drug-related problems than decriminalization, and nothing exacerbates those problems more than criminalization. Once that proposition is widely understood -- and the evidence for it is close to irrefutable -- the central propaganda pillar on which the drug war rests will be gutted.